An ex-con and a teenager crosses paths in a redneck environment. A friendship is formed. But the better friends they get, the more they start sharing problems. The movie is about an ex-con who’re now running a rack-tack outfit of workers. 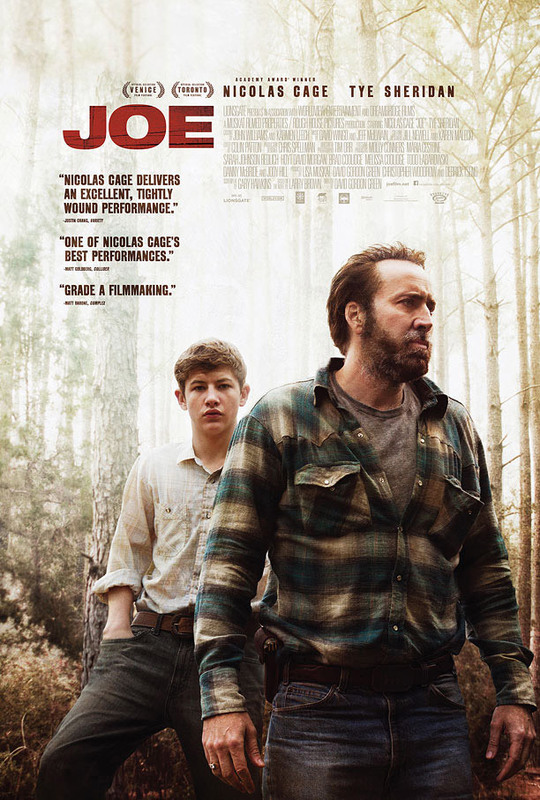 Joe(Cage) is the manager of the team, who’s job it is to kill trees around the forest, so they can be removed and replanted. He crosses paths with a young kid, 15 years, who has some family trouble. Joe has his own worries but also a big heart. And it does not take long for their troubles crosses paths. If you liked Matthew McConaughey in Mud, you’ll enjoy this one too! It’s not exactly a feel good movie, but damn it’s interesting, serious and well acted. It’s been a while since Nicolas Cage has done something good for me, but here he part is very well written and acted, and also the setting is way different than his average heist/revenge/escape/shooting movies. I’m not 100% sure which American state the movie takes place in, but it’s an hill billy environment, where people has accepted to live of of what they got, and it’s depicted very realistically, which really worked for me. The only bit that did not suit me too well was some scenes where it’s as if the Joe and the young kid sense each other on a distance. I did not hurt the movie, but it not help either. I mean they bonds fine through normal social interaction, and as a viewer you really understand their friendship, so IMO no reason to insinuate a spiritual connection. Any way, I was really happy I got to watch this one.